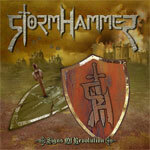 With StormHammer's Signs Of Revolution, we get their fourth platter of Teutonic power metal. As always with this popular, and often abused, genre the question is the same, 'What does the band bring to the table that will distinguish them from the hordes of power metal band?' The answer, to be expected, is not much. Signs Of Revolution is pretty much standard power metal and StormHammer fare. That doesn't make this disc bad, just everyday ordinary stuff. Fortunately, StormHammer is very good at making the same old same old galloping power metal. However, a few additional comments to StormHammer's credit are deserved. Signs Of Revolution seems to show some evolution in StormHammer's style. Overall, it's still heavy, but often trends towards being more melodic also. This is most noticeable in the harmonic vocal arrangements and chord structure of many songs. The best examples, and so the most interesting songs, are 'Signs Of Revolution,' 'From Dusk To Dawn,' 'Ride On A Razorblade,' and 'Sham World.' On the last, StormHammer adds some more noticeable and clever keyboard elements at the outset that a greater flavor to the arrangement, even if doesn't last throughout. Additionally, not everything is breathless galloping power metal when StormHammer varies the tempo within songs like 'Omens Of Agony.' or 'Sham World.' A final nod should go to the terrific 'Bridges To Eternity,' a rather unexpected and well-crafted melodic heavy metal ballad. StormHammer's Signs Of Revolution will probably not set the power metal genre on fire. This is basically very good, but ordinary stuff. Except when StormHammer throws some curves at you with arrangements that are more melodic and less galloping. For fans of the band and the style, Signs Of Revolution will likely be a satisfactory meal. StormHammer's Signs Of Revolution will probably not set the power metal genre on fire. This is basically very good, but ordinary stuff. Except when StormHammer throws some curves at you with arrangements that are more melodic and less galloping. For fans of the band and the genre, Signs Of Revolution will likely be a satisfactory meal.